Impact Wrestling returned from Sam’s Town Hotel and Gambling Hall in Las Vegas, Nevada this week. The opening video touched on all ongoing feuds as we head into next week’s Against All Odds special episode -- with an emphasis on Johnny Impact’s turn and what he has to say about it tonight. The Twitch stream was hosted by Melissa Santos. She was live from St. Clair College in Windsor, Ontario, Canada, where Impact is taping their next set of shows. There was a St. Clair E-Sports Team vs. Team Impact Wrestling competition going on, with Santos interviewing some of the players from both teams. At one point, Melissa played games while Kid Ref hosted the show. The story of the match was that Trey had to overcome Moose's size, which helped Moose block most of Trey's offense. They started with Trey going after Moose’s legs with kicks. When Moose stopped him, Trey went for quick moves and ranas, managing to toss Moose outside the ring. But as he went for a dive, Moose cut him off. Trey got himself a second chance and hit two suicide dives. But on the third dive, Moose caught him in the middle of the air and hit an apron bomb. Trey seemed like he wasn’t making the count, but Moose stopped it and went for another apron bomb, waking up Miguel. Miguel went for yet another dive. Moose caught him again -- but this time he swung Trey into the steps. Back in the ring, Moose worked over Trey for a bit before he reversed Moose's Go To Hell into a pinning attempt. Moose seemed to regain control by hitting a huge lariat, but Trey finally got an opening and hit a top rope dropkick and a springboard dive to get Moose down for a frog splash. Moose hit a pop-up powerbomb for a two count. They traded a few kicks before Trey hit a reverse rana for two. Moose blocked a codebreaker, then tossed Trey into the ring post twice before hitting the spear for the win. The match had several spots that were botched, or looked botched, but aside from that, it was good action. Sami Callihan cut a promo in their oVe TV. Callihan gave Rich Swann one final threat that he will take the X-Division Championship tonight. Okay promo. Back from commercial, Santos interviewed Tessa Blanchard about Gail Kim being suspended. Blanchard said that Kim being suspended is not enough for her and said that if Impact doesn’t want to be sued, they’ll send Kim to the ring to publicly apologize to her and then fire Kim for good. 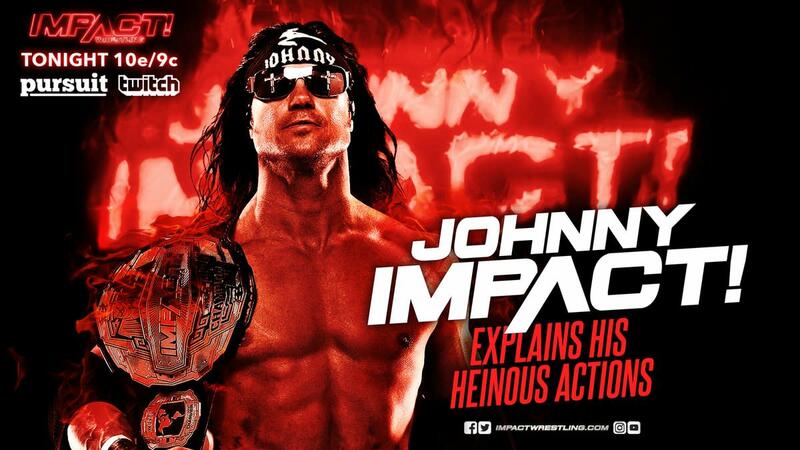 Josh Mathews made the announcement that Johnny Impact defending his World Championship against Brian Cage will be the main event of next month's Rebellion pay-per-view. Drake and Bahh started the match, with Bahh using his size to counter Drake going for a shoulder block and a crossbody. KM and Edwards came in, with Edwards gaining control. With quick tags, Edwards and Drake started working over KM’s arms until he got away to tag Bahh. They traded control of the match for a bit with quick tags, mostly when KM and Bahh tagged in and out. Drake hit a fantastic superplex on KM. Bahh came in and took out Drake with a crossbody. Edwards hit a tope suicida to Bahh, completely wiping him out. Edwards went to get Kenny the Kendo Stick, the most famous Kenny in the world according to Don Callis. The referee tried to stop Edwards, but he tossed the kendo stick to Drake, who hit KM and set him up for Eddie’s Boston Knee Party for the win. The match wasn’t much, but the chemistry between Edwards and Drake is really good. Rolando Melendez, investigative reporter, tried to interview Johnny Impact and Taya Valkyrie outside the venue as they arrived, asking about them turning against Brian Cage. Johnny just blew him off and told him he’ll find out with the "rest of the marks." The GWN Flashback Moment of the Week was Cage vs. Fenix from last year’s ReDefined special episode. Melendez once again tried to interview Johnny Impact -- but this time, Valkyrie literally pushed him into a trash can. Backstage, Rich Swann was with Willie Mack, who told Swann that he has his back tonight when Swann takes on Callihan. Ethan Page walked up and told Mack that he won’t get a chance to go fight oVe because Page is what Mack needs to worry about. Austin started the match by hitting several kicks from complicated positions, ending with a Space Flying Tiger Drop. Back in the ring, Hyde tried to get some offense in, but Austin easily dodged him and hit a springboard boot. Austin hit a senton, a kick combo, a two-foot Curb Stomp, and finally The Fold for the win. Total squash -- Hyde had no offense. Austin has a basic moveset, but he makes everything look incredibly complicated. We got a vignette for Madison Rayne’s return. We also got a video package going over the story between Swann and Callihan. In the ring, Mathews brought out Johnny Impact and Taya Valkyrie. Johnny said that he turned because of the fans. He said that even though he came out and defended the title against everyone, fans didn’t care about him, they only wanted to see crash TV and see him get hurt. Impact said that as soon as a new big meathead came up, they all turned to the new flavor of the month -- except Brian Cage actually believes the fans like him. Johnny said he can’t be loyal to the fans because the fans were never loyal to him. Mathews then asked Valkyrie about facing Jordynne Grace next week for the title. Valkyrie just kind of blew off the question and also went into attacking the fans and defending her husband. Valkyrie said that once she is done with Grace, she won’t allow Impact to decide for her who she faces and when she defends. Finally, Mathews asked Johnny about the Rebellion match with Cage. Johnny said that Cage will get his match, one-on-one, and he’ll once again defeat Cage. He threatened that Cage may not make it to Rebellion, implying that accidents happen. Johnny closed the promo by saying he used to care for all the fans, but now he just cares about Valkyrie and the World Championship. Overall, a good interview -- Johnny was great. Somewhere in the realm of the living, Rosemary met with Father James Mitchell. Rosemary confronted Mitchell about getting the empty vessel that Dark Allie is, but not her actual soul. Mitchell told Rosemary if she wants Allie back, she needs to go talk to his boss. Rosemary hinted she will go talk to "him" in the realm of the undead and get Allie’s soul back. Interesting turn of events. Page jumped Mack before the bell. Page manage to keep the momentum for a while until Mack countered a shoulder tackle into a Samoan drop and moonsault combination. Page left the ring, but Mack followed and they exchanged a few shots, ending with Page having the advantage. Back in the ring, Page worked over Mack, cutting off any chance for a comeback. Page locked in a sleeper, but Mack managed to escape and turned the match with a couple of running strikes and an atomic drop. Mack hit a shotgun dropkick and the running cannonball to the corner for a two count. Mack then hit a DDT for another two count. Page hit a flying elbow for two after tossing Mack from the top rope. They traded a few kicks before Mack hit the stunner for the win. Okay match -- nothing special. Backstage, Melendez tried to interview Johnny and Valkyrie one last time, but up walked Killer Kross, who said something in Johnny’s ear that seemed to benefit him. Johnny walked away while Kross gave the camera a mad look. We got a video package hyping up next week's Disco Inferno vs. Scarlett Bordeaux match. Melendez interviewed Disco, who was just drinking. Disco said he doesn't need to train since he's fighting a girl and he is going to prove to Bordeaux she doesn't belong in the ring. Santos interviewed Gail Kim, who was coming out of a meeting with Impact management. She said that management was taking things seriously. Suddenly, the camera turned to the back where LAX and the Lucha Bros were brawling until security pulled them apart. Konnan came out and said that this is what the Lucha Bros wanted -- LAX just wanted a rematch. Willie Mack was making his way back to the locker room, but he was followed by Jake and Dave Crist. They closed the door and we heard a brawl go on inside before Mack walked out and locked the door. They started quick, with both men trading fists and a quick cutter from Swann to set up Callihan receiving a tornillo dive on the outside. Swann and Callihan then brawled outside the ring -- and within a minute, they made their way to the steel steps. Callihan went for a piledriver, but Swann escaped and used the steps instead to hit a flying elbow. The brawl outside continued with both trading strikes. Callihan dropped Swann with an exploder on the ramp. Back from commercial, Callihan was choking out Swann in the middle of the ring, while also working on Swann’s back with knee strikes. Callihan did his spit chops and hit a big scoop slam before going back to working on Swann’s head -- this time twisting the neck. Callihan got a second sleeper, but Swann reversed it into a stunner and finally got an opening to strike down Callihan and build momentum to take down Callihan with a headscissors. Swann and Callihan traded strikes until Swann got another headscissors takedown for a two count. Callihan hit a powerbomb, a knee to the jaw, and the Get Outta Here for a close near fall. Callihan finally chased the piledriver, but Swann escaped and superkicked Callihan. After a few more kicks, Swann hit a second rope 450 for a two count. Swann went for another, but Callihan recovered. Swann went for Checkmate, but Callihan countered and hit a top rope powerbomb, and after a two count, transitioned into a crossface and into an STF. Swann escaped by reaching the ropes. Callihan spat on Swann, finally pushing him to the limit. Swann hit a Lethal Injection for a two count. Swann went for the Phoenix Splash. Callihan dodged and went for the piledriver, but because he had to do his taunt, he got distracted and Swann rolled him up to retain the X-Division title. After the match, Callihan went to attack Swann with a chair, but Swann stopped him. Swann had the opportunity to take out Callihan with the chair, but suddenly, Mad Man Fulton, formerly Sawyer Fulton in NXT, debuted and took out Swann with a one-handed chokeslam. Mack came out for the save, but Fulton hit an End of Days to take him out too. Callihan hit Swann with a bat to the jaw to finish the job and close out the show. oVe just got a bit stronger. Overall, this was a good show -- mostly when it comes to storyline development heading into next week’s Against All Odds special episode and the upcoming Rebellion PPV.